And the CONSUMABLE bag will get consumable items. No problem with the inventory bag being renamed.. Able to rename the bag anytime i want .. only problem i have is the item icons are gone and all that is shows is a white icon with a huge background picture that covers a lot of space and makes it hard to click on things in my inventory. A nice mod for completely breaking your inventory. Even a clean install won't fix this. The main "Inventory" bag will be renamed something else and no other mod will now recognize the main bag. You can't rename the main bag etc. Nice going. Why a game breaking mod like this is allowed to be downloaded on Curse is beyond me. For anyone reading I would like to second "Do Not Download!" until any issues are fixed. Open a new bag tab and name it INVENTORY. Reinstall this mod and open game. Confirm that the main tab is now called INVENTORY again. Uninstall mod for last time and open game. Confirm that the main tab is still called INVENTORY. i was able to rename main bag. but well im bit late on this train. Could you possibly post your code in the repository section? I'm trying to build a similar mod for myself to get it more to my liking (more bags mostly), but getting started is driving me nuts. It keeps creating more bags every time i reload the ui, and I can't seem to get it to propoerly move items. I'd love to take a look at what you did to get a better understanding of how the whole system works. Is there a way to reset the bags? On my main character, it changed the default Inventory bag to a side bag while making the Glyphs bag the main bag. Makes it hard to keep things organized. My shortcut bar dissapeared. How can I fix this? p.s. hope you've recovered well from your accident. Sorry to hear about that. It was a little funky at first. But it seems to work good now. That being said, if you don't like having bag windows all over the screene. The addon named "Inventory Sort" does a nice job in grouping types of items togeather and stacks them up too. I use both. Not working, full load of crap ! WOrks fine for me. It did take my main Inventory bag and now a custom bag named Main Gear I had is the primary with the money count etc...but no big deal there. 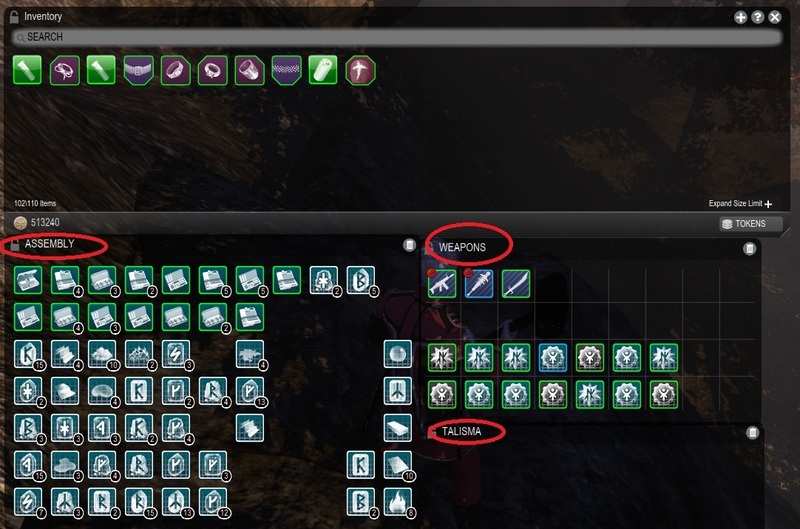 This mod has completely screwed up my inventory. Even after i removed the files repaired game and stuff it has changed the name of my main inventory bag to attack which makes my other mods not work. I can not find how to reset it at all. Further steps taken. deleting all preference files, deleting anything relating to do with bags. deleted all ui files. repaired 3 times. Still my main inventory bag has somehow picked up the name attack and instead of a lock it has a pin. This is causing my ultimate crafter mod to screw up because it can't find the main bag. i think this addon is conflicting with my shortcut menu. Quote from VIVALATREY947 »i think this addon is conflicting with my shortcut menu. I'm having the same issue. The hotkeys simply do not work. Yes, this has been mentioned to him. He mentioned that he has been in an accident. And is currently recovering. So sadly this addon is broken until it can be fixed. I'd really appreciate a post from him saying that this is being worked on. All that would need to be done is to not have a "shortcuts" bag at all, so it won't overwrite the one that is already there, which works just fine in the first place, so I'm not sure why a "shortcuts" bag needs to be created by the addon. Is there any way to make the CONSUMABLE bag getting Quest items or to create a QUEST bag getting them?